Oreo Stuffed Chocolate Chip Cookies combine the best of both worlds: chewy cookies with soft and moist oreos in every bite. These oreo chocolate chip cookies only take 30 minutes to make and are irresistibly good! Plus video tutorial! 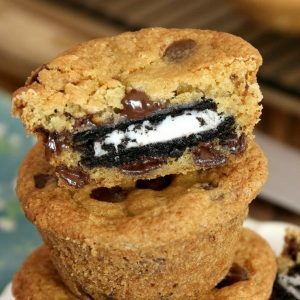 As you guys like our Oreo Cheesecake Cupcakes and Slutty Brownies so much, we’d like to share another fun and delicious Oreo recipe – Oreo Stuffed Cookies! This dessert is a delicious sweet treat to enjoy at home, and they’re perfect for a party or potluck as well. Everyone who tries them keeps coming back for more, and our friends still talk nostalgically about them! Oreo Stuffed Chocolate Chip Cookies are a two-ingredient recipe if you use store-bought cookie dough, but I find homemade cookie dough helps prevent the dough from spreading too much so the cookies are more beautiful after baking. 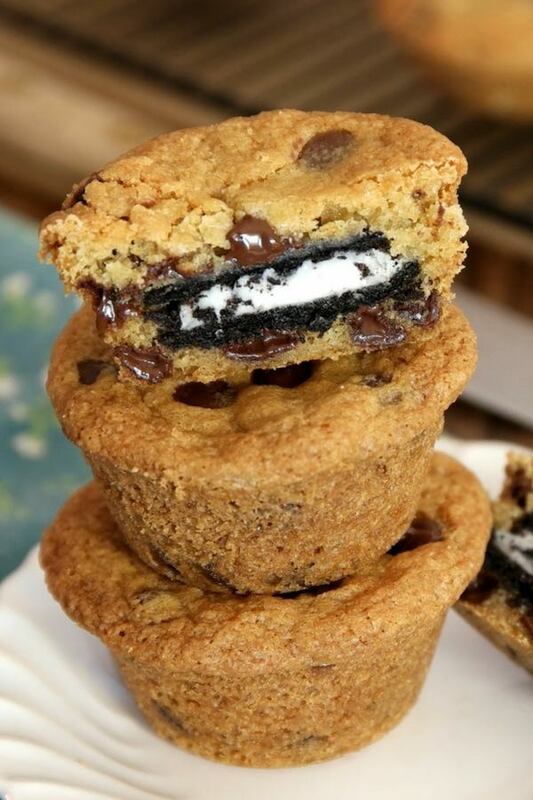 To make them, you need to hide an Oreo inside the cookie dough before putting them into the oven. There are two methods to do this. Take one scoop of cookie dough and make it into ball shape. Flatten it out in your palm, and place Oreo cookie on top, and then add another piece of cookie dough on top. Seal the edges well until a large ball is formed (Make sure the Oreo is completely enclosed with the cookie dough, in the meantime, don’t add too much dough which will cause the cookies to spread too much). Then place them onto parchment lined baking sheets and bake. Let them cool for 5 minutes before transferring to a cooling rack. Press a half-inch layer of dough into each muffin tin. Add an Oreo and then another half-inch of dough on top to fully enclose. This method yields perfectly shaped cookies and exactly the same sizes. If you make the cookie dough from scratch, make sure to soften the butter before mixing it with other ingredients. If you use the baking sheet method, leave two inches between cookies as they’ll expand during baking. 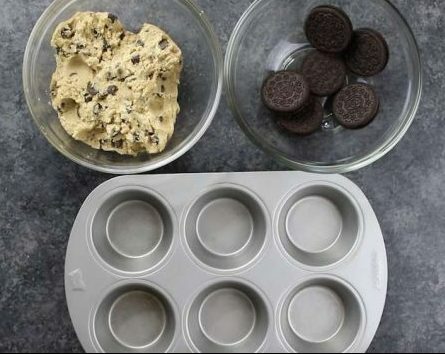 For the muffin tin method, make sure to spray the muffin tin well before adding cookie dough for easy unmolding. If you use muffin tin method, let the cookie cool completely before taking them out from the muffin tin, otherwise they might crack. 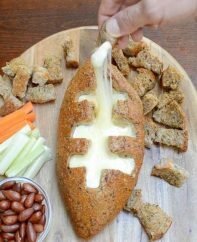 Place the unwrapped butter on a microwave-safe plate or bowl and microwave it on high power for 20 seconds. If it’s not soft enough, add 5 seconds at a time until you get the perfect texture. Yes, just like regular chocolate chip cookies, these ones freeze well for up to one month in a ziplock bag or airtight container. How Long Do Oreo Stuffed Cookies Last? 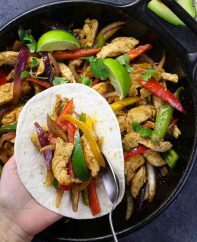 While they taste best the same day, you can keep them for up to a week in an airtight container. When you’re ready to serve, microwave them for 1-2 minutes until the chocolate chips are just starting to get shiny. Preheat oven to 350°F (177°C). Apply nonstick spray to a muffin pan or baking sheet. Fold in flour, salt and baking soda. Then mix in chocolate chips. Press a half-inch layer of dough into each muffin tin cup. Add an oreo and then another half-inch of dough on top to fully enclose. Are they okay to freeze? Can I make 12 cookies and save the remaining of the dough to make it another day? 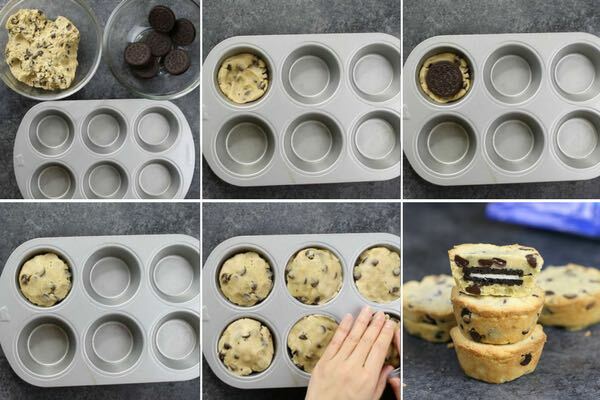 if I do mini oreos and a mini muffin tin, how long should I bake them? Hi Caroline, Thanks for your question. 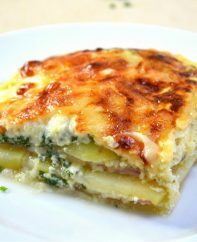 350°F or 180°C is the correct temperature for this recipe. Enjoy! Thank you for video demonstration. I just noticed you forgot to add the chocolate chips to the recipe instructions. I only mention this because my daughter follows recipes to the letter. She’s 9.